We wish each of your families a Merry Christmas and Happy New Year! May you enjoy your family and the memories made. God Bless! 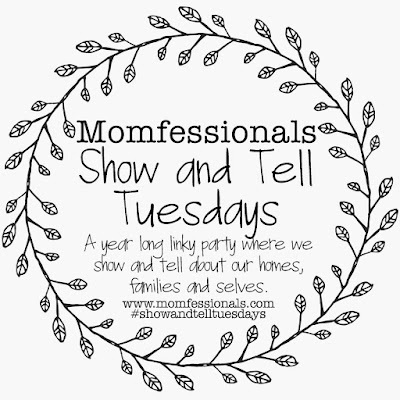 I'm linking up with Andrea and today's Show and Tell is what five dinner guest would you invite to a dinner party. All the guests have to be currently living and it sounded like a lot of fun so here we go! When I was in 8th grade my grandmother mailed my mom a book to read but she never got around to it and I picked it up. Can you guess what the book was.....???? Yep The Notebook. I read the book in one day and was in love with Nicholas Sparks writing from then on. I dreamed of being the girl in the Notebook and was so jealous when Rachel McAdams actually got to do that very thing in the movie. I own every hard back book of his and can not wait till his newest book comes out in October. With that said, I would invite Nicholas Sparks to my dinner because I would love to talk to him about his books and inspirations for his books. I was introduced to Ray back in 2004 when I was at work and my boss was playing his CD that was past down to her from her brother. I immediately fell in love with his soulful voice and now own everyone of his CDs and even went to his concert back in 2008 when I was 8 months pregnant. Many may of heard of his song "Trouble" that is played in commercials. I would invite Ray to my dinner party in hopes he would play some music for us! Just love this guy! I look forward to watching him even when I'm exhausted because he is such a character. Have you not seen these videos #1 and #2!???! Very cool guy and I think he would be a great entertainer at my dinner party. Turn down for Watt!??! What a cool guy and love my Houston Texans! Not only is he a great football player, but he is so generous and really loves his fans. I've heard of some very inspiring stories he has done and just love how he connects with his community. Also how cute is he!? I would invite JJ to my dinner party because he brings it all: charisma, looks, charm. Let's Drink and be Merry!!! 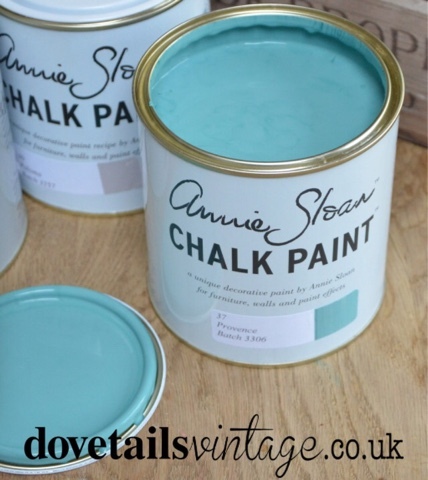 Yall I can not tell you how long I've been wanting to try Annie Sloan chalk paint. Why did I wait so long!?! It seriously is that good. butter together- so you don't see paint lines), putting the wax on is super easy, and how fast I can get a piece done and it looking fab. Many local retailers sell her paint. You can go to her website and find out where in your area. The recommend buying her brushes but I used a 1-1/2" flat brush from the paint store and a linen cloth for my waxing that I had at home. 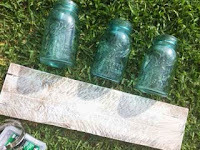 The paint is expensive and the wax is too but it's worth the money and you don't have to use a lot on either to get a great result so I have lots left over for other projects. I bought a pint in Provence ($40) and a sample jar of the clear wax ($18). I already have another furniture project in mind and I might try distressing and colored waxes this go around. 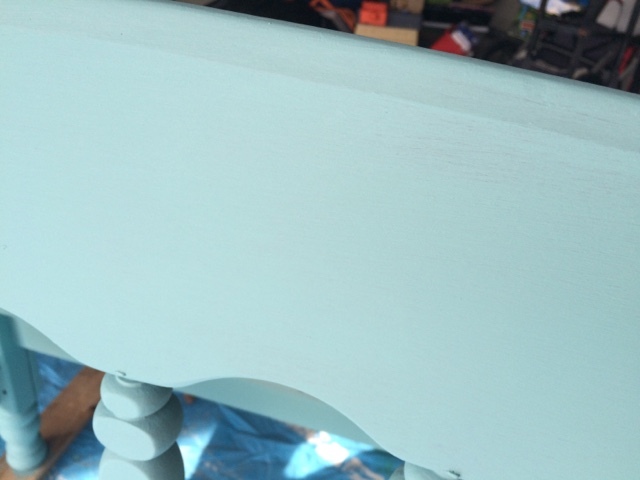 The first project I used the Provence (blue/turq) paint in was this pallet sign for a dear friend's baby nursery. I cut the wood and built the sign. Sealed the wood. Then hand drew out the lettering and painted in the sign. Love how it turned out. The second project was a bench for my entry way. 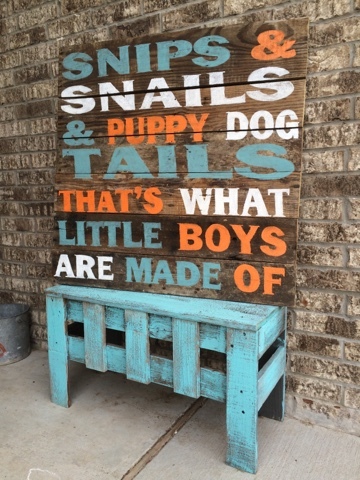 A place for my kids to put their shoes on and add some character to my foyer. 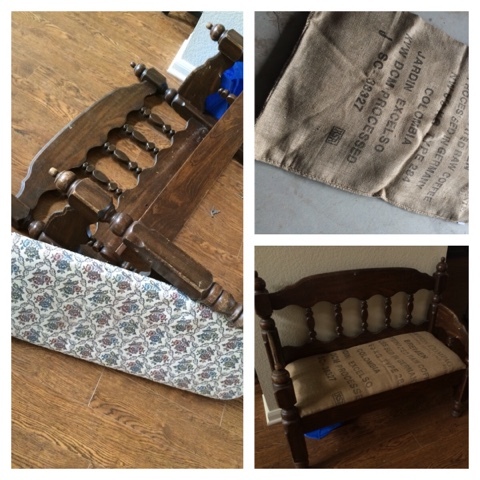 My mom and I found this bench at a junk store in Waco for $60. A steal! I had talked about making it but this was cheaper and the right size. Just needed a little love. The first thing I did was replace the fabric. My mother in law had a few jute coffee sacks. I took one of the sacks and made it into my new fabric. cover the dark wood. I could of gotten away with two but there were a few spots I could still see some brown and so I just put a light third coat. With a pint of paint, it is still almost full. I did two coats one day and a light third coat on the second day. On the second day after it dried I put on the wax. It's like crisco and dried super fast. Then put the new seat back on and wala! Love how it turned out. So much fun! Next project is my armoire and I'm going for French Linen (gray). 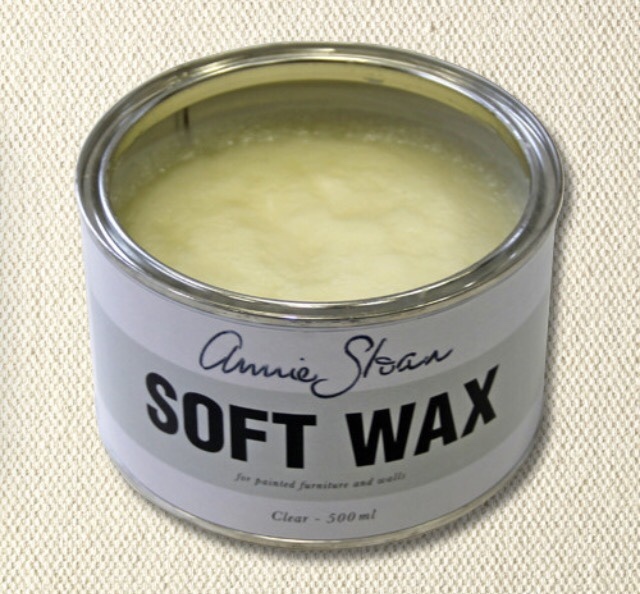 Anyone else ever tried Annie Sloan or have pictures they would like to share??? I am finally in the process of working on some of the other rooms in my house. I've been really wanting to get my piano/study room done because it is the first room you see when you walk into my house. We opted out of having a dining room because we have a large enough table in our eat-in area to host our guest. Also we have a grand piano so our dining room is where it is located, along with my small desk and computer. I decided to play around with Olioboard and create a mood board of what I'm thinking I want my area to look like. Hopefully I can get a head start on it and have it completed by the end of the year. Little by little. I also have been working on my daughter's room and will share at the end of the summer. I have one thing to build, one painting to paint, find lighting, hang something vinyl, get some pillows. My kitchen is also almost complete. I need to find lighting for the eat-in area, and above the bar, need 4 bar stools, and possibly a rug near the sink. What do you think? What are you working on this summer? Would love to hear from you in the comments. This was my inspiration piece from Target. I thought it was super cute, but I did not want to spend $25 on it and I thought I could probably make it cuter for less. I already have a bunch of pallet pieces laying around so while I was painting my bench for our kitchen table I took a pallet in the size I wanted and dry brushed it heirloom white to give it an shabby antique look. Easter weekend my sister-in-law, mother-in-law and I left for Canton for the day. Canton is the best place to find good deals and neat gifts/decor etc. 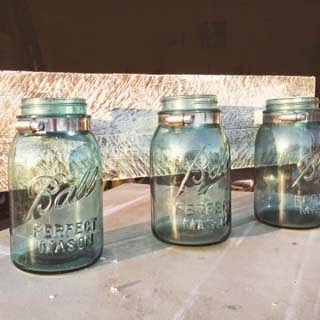 I knew I wanted three jars like the picture so I set out to get three blue mason jars. 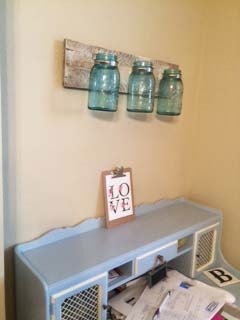 I love mason jars and have quite a collection whether it be my drinking cups or they are used for decor. 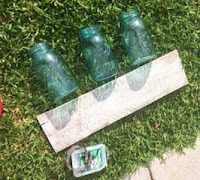 I found the mason jars for super cheap and identical. It was meant to be! Then the hubby and I were at Lowe's and to finish the project I needed three pipe clamps and some hardware. When we got back home I ran into a few small glitches. The mason jars have a smaller diameter on the top than the bottom so to attach to the board I needed to up the height. I found three little wooden blocks that I had from another project and glued them on equally spaced out on my pallet. Once the wooden blocks were glued on I drilled screws into the pipe clamps through the blocks into the pallet. 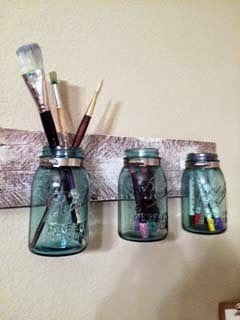 The screws were used versus nails so I could insure it would hold the jars. Then I put the jars into the clamps and tighten them around the jars. Then I attached a wire hanger on the back and hung above my desk. 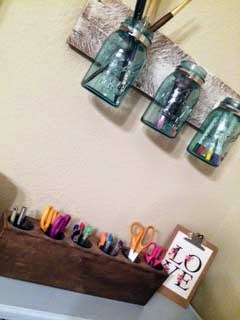 My decor could be decorative or currently it holds my paintbrushes and fun markers and pens. 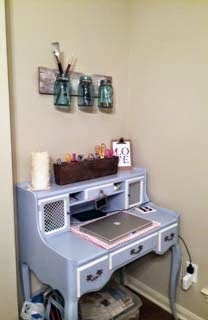 At first I thought I hung it to high above my desk, but it worked out because it could be decor as well as functional and underneath my desk I am wanting to fill the empty space with idea boards and probably some pictures of my kiddos. Definitely a fun quick project! Have you ever thought about how you ended up where you are at? How every decision or event in your life built upon each other and led you to where you are. How God leads you through trials but also provides miracles and joyous occasions. How life can be so dang hard at times but to someone else you have everything they could possibly dream of. I will say I am a very blessed person and it wouldn't be without my faith in Jesus that keeps me going. I could blame many things in my life on other people not supporting me or directing me elsewhere, but it all boils down to me. I made those decisions, good or bad. I am the reason I am where God has me right now. Do I have everything together, definitely not, but I try daily to live with a happy attitude and a happy heart and live my life for Jesus. I personally have gone through my own struggles in life and have fled from God and ran away from my troubles because I was scared or unsure. I have cried like a baby. I have smiled with my whole face and heart. I have hidden in darkness. In the end I have always had to take one step at a time and pick myself up because there is always a light at the end of the tunnel to something bigger and better. In my adult/marriage life I feel like God has tested me the most. Patience has definitely been at the top of my list and a word that doesn't come easy. Nick and I have been patient for a long time and we are still working on that word. We have often felt God has given us a green flag and then in a matter of minutes we are knocked back down again. I keep hearing the word "baby steps". Yep that is what we have been doing for a long time - baby steps. I'm tired of baby steps...I want to take a giant step. I want a for sure thing. I want this rock lifted off part of my shoulders. I want to feel free again. Then I'm back to the word patience again. I know God's timing is perfect. Nick and I have definitely been through that before. So we keep trusting in God and praying, and having people pray for us that 2015 is going to have some great things in store for our family. Many people asked how we ended up where we are today. Nick and I are pretty simple people, with a lot of love to give, and an adventurous soul. We live life to the fullest and enjoy meeting people on the way. We've always had our dreams and what we want out of the life and for our family. In January 2014 we hit rock bottom. We broke straight through to the core and the ground shook. It shook hard. We were both scared and our dreams became crazy real. Nick was sick. Answers could not be found. Many nights spent at the hospital and shuffling kids and getting myself to work. We both felt helpless and lost. Sure I probably told you things were fine, we were moving along, but deep down I was hurting hard. I was terrified. I couldn't possibly describe to you how Nick was feeling on the other end. All I know is he had a lot of time to think. God is good, he performs miracles and not always gives you answers. And that is exactly what he did. Four months later we sold our house and made our dreams into reality. We knew making our dreams come true would come with a price. We knew we would end up hurting people, but not intentionally. We knew we would be leaving a great church family. We knew we would be removing ourselves from our support group of friends. From our support group, our family. We knew financially we would be hurting again for a short time. But that ground shook and God said follow your hearts and desires, listen to me for I have something better prepared for you and your family. We prayed. Oh how we prayed and questioned. And things have slowly fell into place. Is the puzzle finished yet? No, but it is close. Will it ever be finished, probably not. This past year has been a roller coaster of emotions, but we both have felt peace and we followed God. ".......................It truly is your world to conquer and make the most of it to whatever level you strive to pursue. It is your future, and it is your dream from which to make reality....................Control your destiny and do it with character. Enjoy and treasure every moment along the way......................"
You only live once and the choices you make will lead you on a path. You might not have full control on the path you are led on, but trust in God and his path will ultimately be the right path. That path may have struggles, but it may have amazing moments. God never gives you more than you can overcome. Overcome and become stronger. Overcome and mentor others. Overcome and see the beauty in life. Nick and I are overcoming and we still need your prayers. We are right where we need to be. 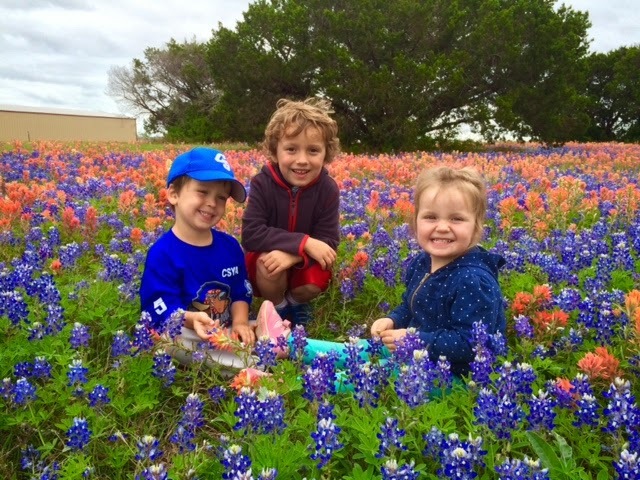 Enjoying our three little blessings. Enjoying nature and God's beautiful land. Enjoying and learning new things about each other. Enjoying the simple life. Starting new in a great church. Living our life for God. No doubt we are blessed and for that I'm thankful. I'm thankful for everything that has led me to this moment because whether good or bad it has made me who I am today. It has given me these three blessings. Yes I will admit I love turquoise. How could you not!? It is exciting, calming, rich, and reminds me of the beach. With that being said that is my accent color through a majority of my house. 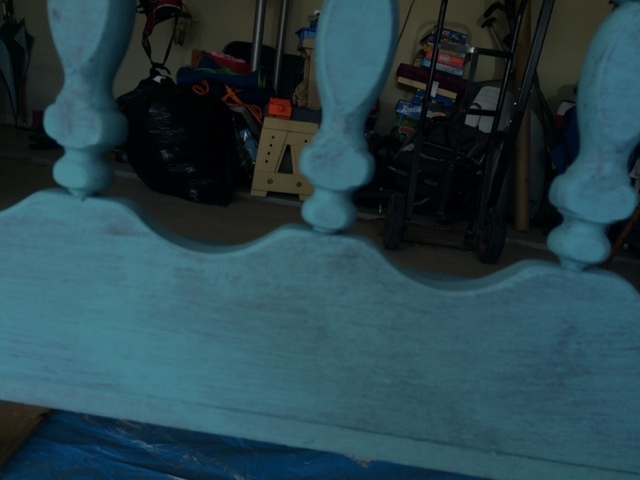 My husband and I recently built a farm house table out of pallets (you can view here) and on one side closest to the wall we are going to eventually build a large bench for our kids and then on the other side I wanted 4 mix-matched chairs in a turquoise monochromatic color scheme. I set out to my antique and consignment shops and purchased 4 different chairs. To find the perfect chair is very hard and so many people want to sell sets of chairs and not individuals. Then when you find an individual chair its broken or not exactly what I was looking for or way too expensive. It took me two weekends!! Once I got the chairs I wiped down, sanded, and primed each chair. My local Ace Hardware was having a sale in March on paint. 99 cent pint cans. You can not beat that! I picked out my color scheme and bought 4 cans. I love how it turned out and the pop of color it brings to my eating area. 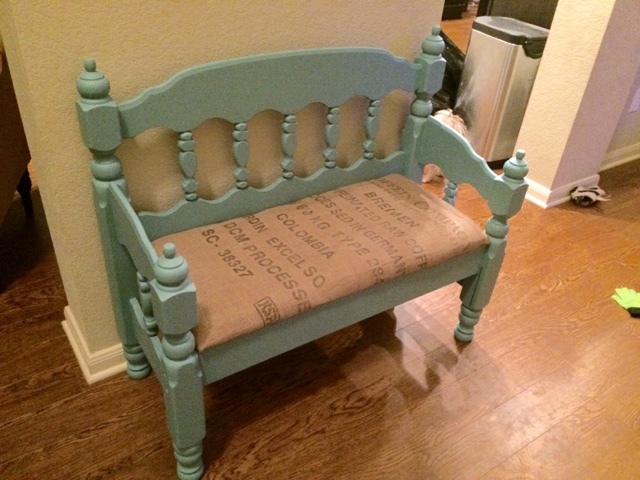 Next on the list - Annie Sloan paint and my birthday bench! Any tips I should know? Post below.